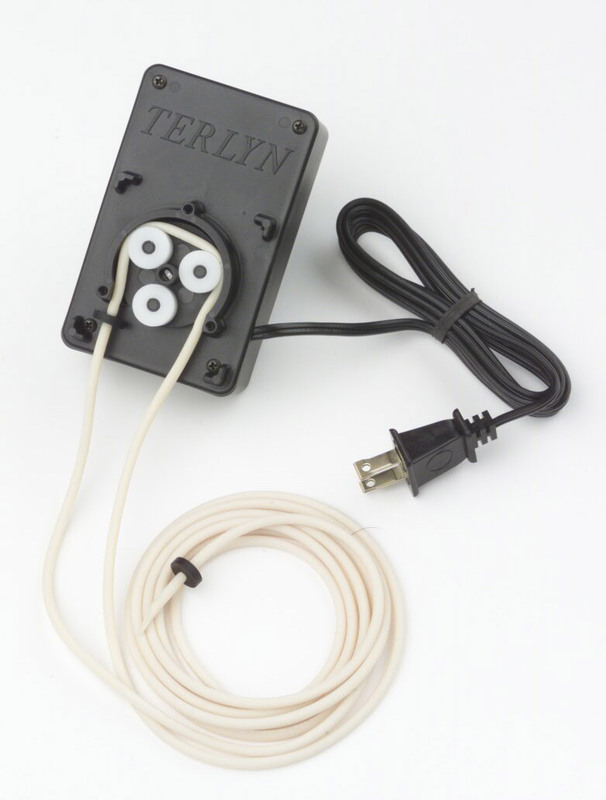 Terlyn CVX Peristaltic Feed Pumps are an accurate and inexpensive method of metering a wide variety of fluids and liquid chemicals without product contamination. The CVX pump is a masterpiece of simplicity. Its quiet compact design makes it suitable enough to withstand the hars environments of industrial applications. With only three moving parts, reliability of the CVX pump is exceptional and the peristaltic design offers many advantages. The heart of the CVX pump is its synchronous, fixed rpm, gear reduction drive motor. These motors are UL & CSA approved and impedance-protected against overheating, even if the motor shaft is loaded to zero rotation. The drive motors are totally enclosed die cast construction utilizing hardened, dual flat output shafts, bronze bearings and are lifetime lubricated. CVX peristaltic pumps are extremely quiet and the synchronous drive design insures consistent accuracy without the use of electronics, timers, or any other control devices that increase pump complexity. Each CVX pump is supplied with eight feet of tubing which can be periodically advanced through the roller housing, approximately every 8 to 12 months. By advancing a new section of tubing into the roller housing, overall tubing life can be significantly extended. Additional tubing and a variety of connectors are also available. If your application calls for a specific feed rate not shown on the chart, we will be glad to work with you. CVX pumps carry a one-year replacement warranty, except in the case of mususe or improper application. Feed tubing is a perishable item not under warranty. CVX series pumps are designed for continuous operation and are capable of extremely low feed rates. The fixed rate of each pump is determined by the combination of motor RPM and tubing size. With six tubing sizes and a variety of motor RPMs available, feed rate selection is numerous and expandable for custom applications. The drive housing design and custom peristaltic tubing allows interchangeability of all six tubing sizes with any CVX drive. All CVX Series pumps use FDA-approved Norprene tubing and are suitable for food handling applications. This tubing is also resistant to hundreds of different chemicals making the CVX Series pumps quite versatile. Peristalsis occurs with the compresion and dilation of the feed tube between the rotating drive rollers and stationary tube housing. This action creates the netering force necessary to move fluid through the tube without using diaphragms, valves, or impellers. By design, the tubing is compressed and sealed at two different points within the housing at all times. This eliminates the possibility of siphoning and allows instant fluid delivery in start/stop applications. Since the fluid being transferred is always contained within the tubing, exposure to air, contaminants, or moving pump components is eliminated. CVX pumps can operate dry without damage. Terlyn designed the CVX Series to match its need for an accurate, quiet, economical and reliable feed pump. It is called on for a variety of water treatment applications involving Cooling Towers, Boilers, Evaporative Coolers, Humidifiers, Water Conditioning Systems, and other OEM applications. 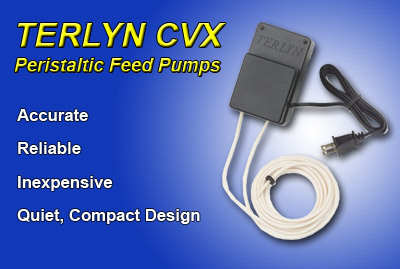 If you are looking for a quiet, compact, accurate, and economical feed pump, the TERLYN CVX Series may be the perfect choice for your application.